Across college basketball, attendance has been declining for a decade. Data from NCAA.com show per-game Division I attendance hasn’t increased year-over-year since 2006-07. UIC’s significant commuter presence among its student body adds an extra complication, especially since Athletic Director Garrett Klassy notes students provide much of the atmosphere at college games. But competing in a city the size of Chicago perhaps poses the biggest and least fixable issue, particularly on weekends. “We’re competing against movie theaters, we’re competing against opera, we’re competing against anything that is disposable income of entertainment for the family,” Klassy said. What’s more, UIC battles its perception among students with busy class schedules. “I try to come to most of the games, but if there’s an exam, I don’t come” said Harshdeep Ingle, a graduate student studying mechanical engineering. Ingle generally attends games with a group of basketball-loving friends who want to support the university. Without a winning tradition to draw in students, it’s hard to win new fans that don’t watch much basketball. Students said promotions like the $1 hot dogs and beer on Senior Night against Wright State on February 25 help, but that likely isn’t sustainable over a full season. Others said lack of organization among students could be a factor, something UIC might be able to help with. While the UIC Pyromaniacs student section already serves this purpose, students didn’t feel the message gets through. “I think what would be nice and would attract a lot of people would be to form an official group to create a pretty good atmosphere at the games and make you want to come back,” said Leo Gonzalez, a sophomore who attended his first UIC game on Senior Night. UIC has a couple of advantages as it seeks a path to profitability. First is the aforementioned alumni base. With sustained success, UIC feels it can draw in local alums. Ptak and Kyle Decker, UIC’s assistant athletic director of tickets and fan development, point to Horizon League peer Northern Kentucky’s recent success as a potential model. In their fifth Division I season, the Norse won the conference tournament and earned a spot in the 2017 NCAA Tournament. Ahead of the 2017-18 season, Northern Kentucky announced a growth in season ticket sales of over 66 percent; the Norse’s 2017-18 attendance finished second in the league at 4,135 per game. UIC basketball appears headed in a similar direction. The Flames finished 20-16 (12-6 Horizon) in 2017-18 to place third in the league to Northern Kentucky’s first, and they return seven of nine rotation players next season. It isn’t a stretch to think UIC could become the Horizon’s preeminent team over the next two years. “If I was a fan of UIC and I heard we’ve won about six in a row, I’d come to a game,” senior center Tai Odiase said during the Flames’ win streak. How closely win percentage and attendance correlate, however, remains to be seen. From examples like Northern Kentucky, UIC has reason to believe a consistent, winning program will draw in fans. 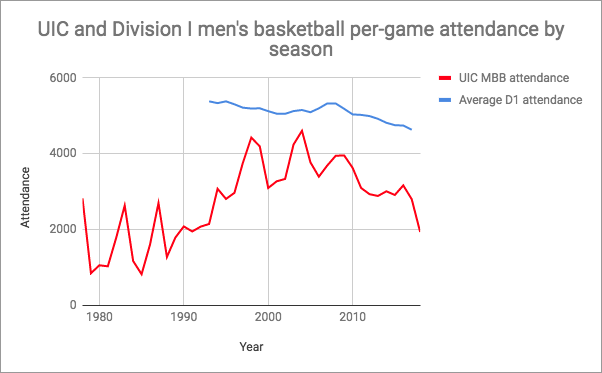 But while UIC’s three best teams over the last 24 seasons have drawn the best, the Flames have fielded other successful squads that haven’t drawn as well. Having said that, it’s difficult to build a fan base and a profitable men’s basketball program without on-court success. UIC is headed that way, and Klassy feels the athletic department can take advantage.